First impressions: When I plugged my system into the Supra MD06-BS/SP mains block, it seemed a hit-and-miss thing. It did possess a solid sonic footprint and showed a knack for lifting performances when one was not paying attention. Initially, it seemed particularly more adept working within the relatively easier parameters of acoustic and close-miked recordings than outright head-banging stuff. That said, there were times when I also felt that its output was a little shy of what it should deliver. Specs: The MD06-BS/SP is constructed from extruded aluminium to shield against RF and mains-borne interferences. Build quality is par for the course – this is certainly much better constructed and spec’d than your common hypermarket variety units. 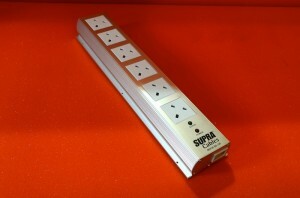 A three-pin IEC socket connects the block to the wall socket, so you can use any power cord of your choice – this also allows Supra, better known for its wires, an opportunity to match the MD06-BS/SP with one of its Lo-Rad power cords, no doubt voiced for better sonic synergy. 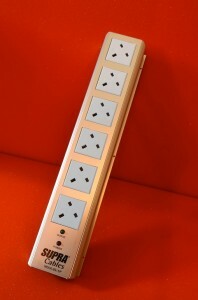 This model, among the handful in the company’s range, has six 13A UK-standard inputs. Its insides include a non-intrusive transient filter (NIF) and three-way surge protector. A series of holes are also drilled into the block, making for ease of wall-mounting. A nice touch. The NIF, developed by Ben Duncan Research of England, is a mild filter claimed to reduce the effects of mains-borne noise without affecting the equipments’ transient properties. When it comes to surge suppression, the MD06-BS/SP’s claimed protection capabilities go three ways – live to earth, neutral to earth and live to neutral, adding a measure of reassurance to what’s on offer. Performance: The non-intrusive system translates to an appreciable increase in midrange clarity, a sense of recordings opening up to take listeners to levels of insights closer to the music. I also noted a slight reduction in the noise floor, very helpful in painting a blacker picture of proceedings and giving the impression of more depth. The overriding sonic description was relatively smooth with a hint of sparkle at the top end – percussions sounded less contrived and metallic, with a more natural-sounding sheen. The lower registers did not overtly suffer at all from the top end opening up; if nothing else, the perceived increase in clarity served to amplify the system’s subtleties appreciably. Upon further listening, the MD06-BS/SP’s contributions were somewhat a mixed bag. The improvements were more evident via analogue than digital – the lowly Rega P3-24 turntable felt even more organic than usual, with a delicacy to the midrange that was somewhat difficult to pin down. When I removed the Supra from my setup, I expected the soundstage and depth to fall flat and a return of digital nasties from a less-than-well suppressed noise floor. I was rather glad that the results were not as dramatic as I originally anticipated. This wasn’t to say that the MD06-BS/SP didn’t work; rather, its overall contributions were sometimes not immediately evident. Prolonged listening will have you re-checking your mental notes on how your system used to sound without the MD06-BS/SP in place, and you may on occasions, as I did, find it somewhat difficult to place the improvements the mains block brought about into the setup. The good: The MD06-BS/SP is literally invisible, in the physical sense. As a fit-and-forget proposition, the mains block was unceremoniously shoved to the back of the gear stack and stayed there for pretty much the entire duration of the review. I’d say the use of aluminium extrusion has been put to good effect. Whilst aesthetically pleasing, the perception of material value is on the right end of the value-for-money spectrum. That the MD06-BS/SP is a six-point item only adds to its appeal – a single strip will be more than sufficient for most bar the most complex of setups. The fact that the block is able to accept various power cords makes experiments possible, allowing for further fine-tuning of the system. The ungood: Here’s the thing about distribution blocks – they all work as described in the box and odds are you’ll probably only notice how they contribute to the overall system when they’re taken out of the chain. So it doesn’t really come as much of surprise that the Supra mains block perhaps made its strongest statement when it was removed from the playing rig. The use of an IEC receptacle means that punters will incur additional costs in buying a separate power cord – but this is just nitpicking, as many users will, in fact, welcome such flexibility, even if it adds to the ownership cost. Final verdict: The economist in me believes that there are ways to yield better sound from a given setup without breaking the bank. I am, however, beginning to warm up to the idea of add-on ancillaries that give positive benefits, as evidenced from the Supra. For those stepping up from beyond starter systems, something like the MD06-BS/SP will make for a sensible purchase and will, within the right context, deliver tangible dividends that don’t make for too rapid diminishing returns. From a security standpoint alone, just having a surge protector is policy enough for a good number of people in justifying a purchase. But, as always, the proof of the MD06-BS/SP’s sonic contributions is in the listening – it is like icing on a well-balanced setup. When in doubt, just disconnect it and hear the difference again. Malaysian distributor: A&L Audio Station (+603-2282 9884) / Find your distributor. A non-practising economist, KN, in between his day job at a Malaysian telecommunications giant, tries the delicate act of balancing family/music/automobiles and all the nice things big boys aspire to, though not necessarily in that order. Although convergence is now his area of interest, he has been known to succumb to regular mood swings, often characterised by a sudden pre-disposition towards round black stuff that spins at 33.3rpm. And as with most of us, he also aspires to and dreams of world peace. Oh, and a pair of Jeff Rowland monoblocs.